A security framework for a workflow-based grid development platform. | Network, Information and Computer Security Lab. A security framework for a workflow-based grid development platform. Title A security framework for a workflow-based grid development platform. 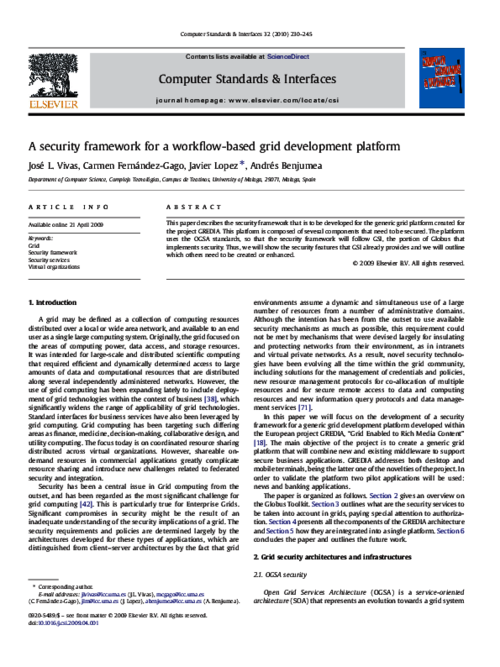 This paper describes the security framework that is to be developed for the generic grid platform created for the project GREDIA. This platform is composed of several components that need to be secured. The platform uses the OGSA standards, so that the security framework will follow GSI, the portion of Globus that implements security. Thus, we will show the security features that GSI already provides and we will outline which others need to be created or enhanced.